This publication presents the first documentation of Nzadi, a Bantu language spoken by fishermen along the Kasai River in the Democratic Republic of Congo (DRC). It is the product of extensive study by the authors and participants in field methods and group study courses at the University of California, Berkeley, and consists of ten chapters covering the segmental phonology, tone system, morphology, and sentence structure, followed by appendices on the Nzadi people and history and on Proto-Bantu to Nzadi sound changes. Also included are three texts and a lexicon of over 1100 entries, including a number of fish species. Prior to this work, Nzadi had not even been mentioned in the literature, and at this time still has no entry as a language or dialect in the Ethnologue. 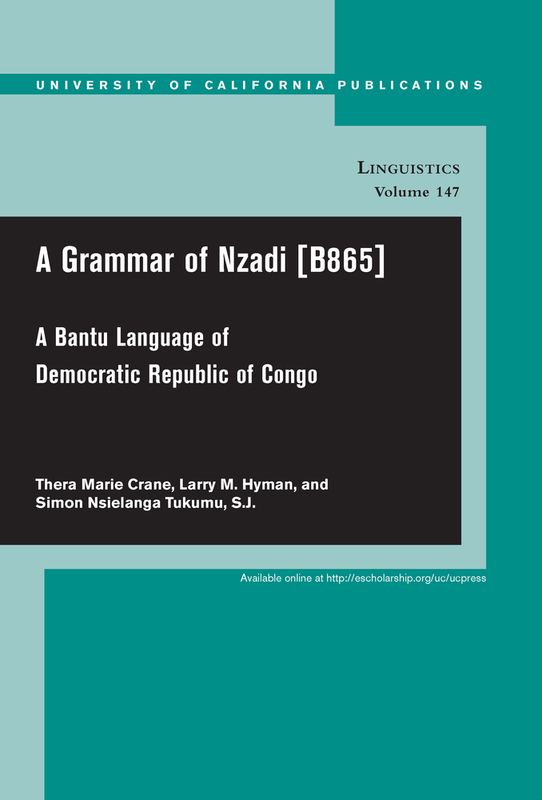 Of particular interest in the study of Nzadi is its considerable grammatical simplification, resulting in structures quite different from those of canonical Bantu languages. Although Nzadi has lost most of the inherited agglutinative morphology, there are still recognizable class prefixes on nouns and a reflex of noun class agreement in genitive constructions. Other areas of particular interest are human/number agreement, tense-aspect-mood marking, non-subject relative clause constructions, and WH question formation. 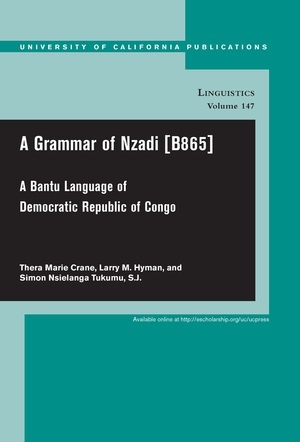 This succinct, but comprehensive grammar provides broad coverage of the phonological, grammatical and semantic properties that will be of potential interest not only to Bantuists, Africanists and those interested in this area of the DRC, but also to typologists, general linguists, and students of linguistics. Thera Marie Crane is a postdoctoral researcher with the Grammaticalization and (Inter)Subjectification (GRAMIS) project at the Royal Museum for Central Africa in Tervuren, Belgium, specializing in tense, aspect, and mood expression in Bantu languages. Larry M. Hyman is Professor of Linguistics at the University of California, Berkeley, and specializes in phonology, typology, and African linguistics. Simon T. Nsielanga is a Jesuit Vice-Directeur of Loyola Hope Center in Lome, Togo, and a researcher in pre-colonial and colonial political African history.